I don't think i will ever stop being a fan of the lovely ladies at janchristie. i have a huge collection of their nail art stickers because they are great quality stickers, really easy to use, and of course, the stickers are pictures of cute animals! In early December, i purchased some Christmas themed nail art stickers and wore them on a night out in Derry with the girlies. For the glitter on my thumb nail, i used a lovely Models own red glitter on top of a red by Collection 2000. 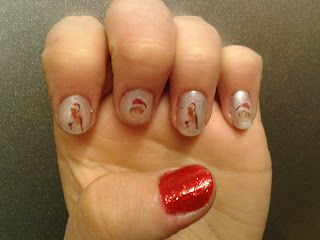 Did anyone else purchase some Christmas nail art stickers from janchristie or anywhere else?